The following is an excerpt from our book, Living The Dream On A Box Wine Budget (Petrina Collins and Casey Quinn) now available for download on Kindle and Kindle apps for iPad, iPhone, iPod Touch, PC, Mac, Blackberry and Android-based devices ($2.99 at amazon.com). Irrational behavior is often blamed on the rollercoaster ride of hormones. Whether it is labeled as PMS or menopause, women have a built-in excuse for bad decisions. Tami had the good sense to opt for major surgery to end the monthly madness. I think there was probably some medical reason for the surgery, but I’m sure it paled in comparison with the other unquestionable benefits of the procedure. Naturally, I was wildly jealous of her seemingly simple solution. One day, before Tami’s epiphany of life without the threat of pregnancy, exhausting mood swings, or periods (usually resulting in husband, Jim, asking incredulously, “Again?”), she fell under the evil spell of estrogen and made a decision that eventually landed her in dog court. The day started like any other. The kids were unrelenting in their pleas for a companion for their golden retriever, Rookie, who had already begun receiving AARP newsletters. Truth be told, I don’t think Rookie really had any interest in cultivating new friendships at that point in his life. Hmmm…sounds familiar. Maybe Tami and Rookie had more in common than we thought. Anyway, she let her guard down and found herself driving down the road that dead-ended with Tami asking herself, “What have I done?” And in the blink of an eye, a new member was added to the family. Tami knew the instant Max entered the car for the drive home that she had made a huge mistake. 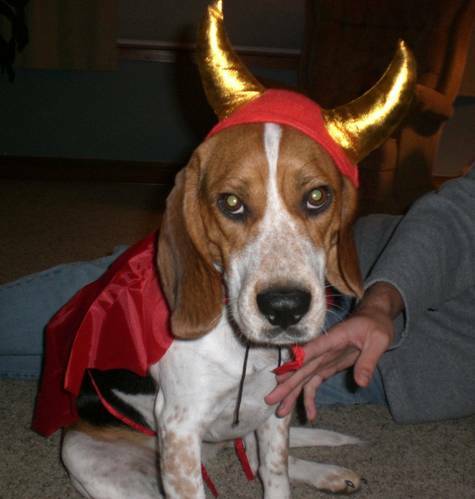 He was a beagle puppy, and like all puppies, was lovable at first glance. That’s the evil part of the whole thing. Tami hadn’t had puppy experience, having adopted Rookie after he’d passed that stage. His worst habit was his penchant for take-out pizza. And he most certainly had the common decency to do his business outside the house. Max had a lot to learn and seemed absolutely unwilling to do so. I’ve learned that beagles can be that way. When we were researching dog breeds, I thought knew what I wanted. I was looking for a small-sized, smart breed. (Side note: I always say I wanted a small breed and my husband wanted a large breed, so we compromised and got a large breed. Sound familiar?!) Beagles fit the size requirement I was interested in and everything I read indicated that they are a very smart breed. What I did not understand, though, was that on every website I checked, warnings were always issued for taking on a beagle. Because they are so smart, they can be difficult to train. Huh? So, this was what Tami was faced with: a hyperactive, house pooping, baying hound that would regularly escape the house and take off through the neighborhood whenever the opportunity presented itself and a senior citizen canine that probably was the one opening the doors for Max’s (hopefully) final release. Now that I think about it, being a golden, he probably knew that getting rid of Max once and for all would be the ultimate gift he could give to his (female) master – maybe they’re not so dumb after all. And she was fine with letting nature take its course. Hey, if Max wanted out so bad, then who was she to stand in his way? But, between the hysteria of the kids at the thought of him getting away and “helpful” neighbors who would walk through fire to return a lost pet back home, Tami was at her wit’s end. It became painfully clear that Max would never go away, and would most likely outlive her, just out of spite. It was then that Tami began to suffer from dreadful “allergies”. The evidence was undeniable – Max was the cause of Tami’s symptoms and the only solution was to find another home for him, maybe on a nice farm somewhere. Far, far away. God works in mysterious ways, and it happened that Jim and Tami were out to dinner the very night that Tami decided Max’s fate. The waitress at the restaurant seemed distracted and at the end of the evening she apologized, explaining that her beagle had just died and she was very distraught. To add insult to injury, she told them the she suspected her neighbors of poisoning him. (Tami understood.) Well, it just so happened that they had a beagle puppy that needed a good home. Would she be interested? It seemed too perfect. Never mind that the good home Max was being transferred to was located right next door to beagle poison – killing neighbors. That was probably just a fluke. Well, life was good for a while, until Tami began getting notices from the county informing her that their dog had not had his rabies vaccination. Tami ignored these notices (yes, plural) which turned out to be a big mistake. (Tami and I like to think that we serve an important function in providing cautionary tales. Please take note.) She knew that Rookie was up to date on his shots, but of course, it wasn’t Rookie who was under investigation. Max managed to rear his ugly head again and get the last laugh. Thinking a simple phone call explaining that they no longer owned this dog would suffice, Tami contacted the County Animal Control and related her sad tale of beagle allergies. That was all fine, she was told, as long as she could prove she no longer owned the dog in question. What? How do you prove that you don’t own something? She was given a court date and advised to provide witnesses to testify on her behalf, if necessary. After I finished laughing, I agreed to accompany her. You learn something new everyday. And we learned that animal court actually takes place in the same building as real court. And not just the courthouse that deals with civil cases. Oh no. Her case was being heard in the criminal courthouse, where all the scary people are, including, it happens, many of the dog owners themselves. They seemed right at home and were probably using the opportunity to visit family in courtrooms down the hall. Eavesdropping on some the conversations while waiting her turn (which was not hard to do, as they ranted rather loudly), Tami learned that most of her newfound friends were no strangers to the legal process and seemed well versed in animal law. When her number was up, the judge took pity on her and dropped the charges. We suspect he had probably owned a beagle at some point in his life.